The University determined the location of the piece — the stairwell between the first and second floors — but left the other details to Hernmarck, who addressed two needs in her conception for the piece. She wanted the designed image to collectively represent the various art forms that are studied within the building — painting, ceramic, jewelry, textile, industrial design, theater, dance and music and she wanted the design to fit within the chosen area and increase the feeling of space in the stairwell. Designed during the summer 2009, Hernmarck settled on a theme for the design: tabula rasa, the unwritten page, also a piece of ceramic that is scraped clean of marks after each use. Hernmarck’s Tabula Rasa would represent the beginning of the creative journey, whether at inception or at the commencement of an additional phase of the creative process. During sketching, Hernmarck often finds the road to a final design through a process of changes or “scraping away” of initial ideas in such a way that previous marks still become part of the overall design. The early phase of Tabula Rasa is referenced in the few words written on a white page woven in the tapestry. Hernmarck achieved the feeling of space for the stairwell that she envisioned by painting and then photographing small cut-up pieces of watercolors so that they cast shadows creating an image of being in flight. This enabled her to place the smallest of the elements of Tabula Rasa closest to the plane of the image, i.e. the place with the most sense of urgency. The final design includes a play on shadows to create a visual illusion on different levels which solved the challenge of designing the lower portion of the work to catch the eye of a person walking up the staircase. Alice Lund Textiles, Borlange, Sweden produced the tapestry. The main weavers were Britt-Marie Bertilsson and Ebba Bergstrom. 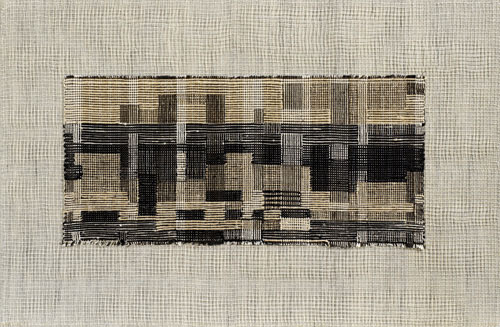 Tabula Rasa is the twenty-first tapestry of Helena Hernmarck’s design and technique to be woven at Alice Lund Textiles since 1975. The weaving took 30 weeks from beginning to finish. During this time, Hernmarck visited the studio periodically in order to oversee the quality of the work and to participate in both the weaving and the dying process of the wool with its numerous variations, shades and values. The colors were custom dyed at Wålstedts Textile Spinning and Dying Workshop in Dala-Floda. For Tabula Rasa the workshop dyed 24 kg of wool in 41 different colors. Hernmarck prefers to use of a variety of different qualities in the spun wool, such as thin gobeline, gobelin with rya wool, and single-ply rya wool. The final work includes hundreds of different colors and textures. 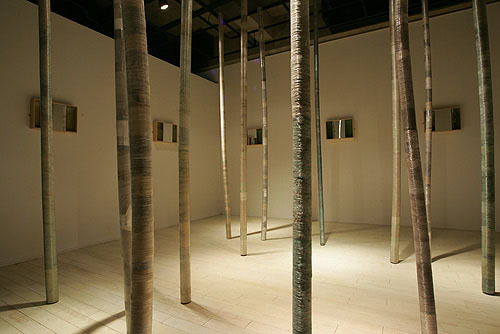 A video of the weaving of Tabula Rasa can be viewed at http://browngrotta.com/Pages/hernmarck.php. Hernmarck’s unique technique combines different weaving methods and patterns with which she has experimented for more than 45 years. 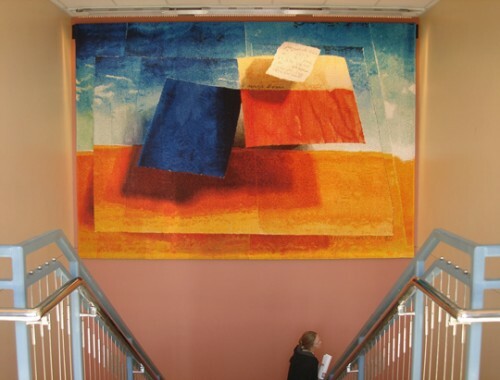 The Hernmarck tapestry technique creates a coarse texture much like the Impressionists’ painting style of the early 1900s. A full-scale enlargement of the image in black and white is created before beginning the tapestry. The cartoon is then adhered to the back side of the tapestry and draped over an aluminum tube that presses the cartoon up against the warp from underneath. The cartoon makes it possible to follow the forms and shadows that can be seen through the warp threads. In order to observe what the weaving will look like at a distance, the artist looks through a small pair of binoculars, turned backwards. 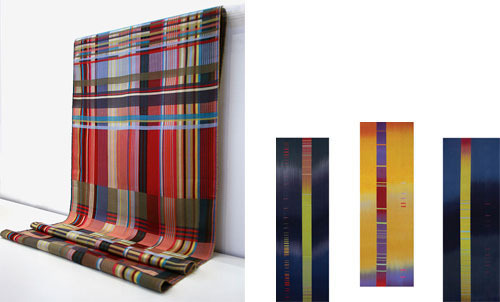 While the tapestry is woven on the horizontal loom, only 50 cm of the tapestry can be viewed at one time. The ongoing action and reaction in changing colors and weaving techniques creates the overall beauty of the tapestry. You’ve got just under a month to see Inspired by: The legacy of Anni Albers and Anni Albers: Design Pioneer at the Ruthin Craft Centre in Wales, which close on February 6, 2011. Believing that aesthetics should be a consideration in every aspect of daily life, Anni Albers joined the Bauhaus as a student in 1922. Though she was initially interested in painting, Albers and other female students were encouraged to join the Weaving Workshop, which included a class taught by Paul Klee. One of the foremost textile artists of the 20th century, Albers experimented with new materials and elevated textiles to an art form. Her work has had an influence on generations of designers and craftspeople, including the six contemporary UK artists/designers whose work is featured in Inspired by: the legacy of Anni Albers. Anni Albers: Design Pioneer, in Gallery 2 was produced in conjunction with the Josef and Anni Albers Foundation in Bethany, Connecticut. Anni and her husband, Josef, were pioneers of Modernism.This is the first exhibition in the UK to show Anni Albers’ textiles and jewellery, as well as her works on paper. Focusing on inventive and innovative aspects of her work, the exhibition identifies the threads that connect her different ways of working. The Ruthin Centre is at Park Road, Ruthin, Denbighshire, Wales. For more information call +44 (0)1824 704774 or visit: http://www.ruthincraftcentre.org.uk/08artists.html.